How many words should my blog posts be? The quick answer is that longer is better. That is assuming that you have quality content within your post. Let’s take a look at the three biggest studies on word count, so that we can narrow it down to an actual number. SerpIQ found that the average word count of posts ranking number one on Google was a little more than 2450 words. Even the posts that ranked #10 on Google had a word count north of 2000 words. 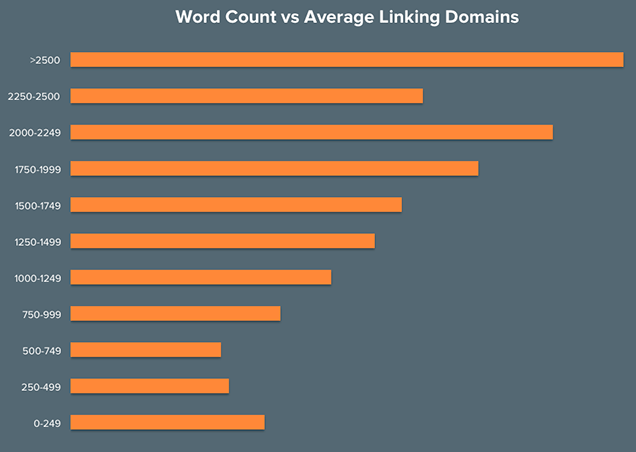 Another study by Phoenix Hug looked at the correlation between word count and backlinks. The results found that post with greater than 2500 words received the most backlinks. 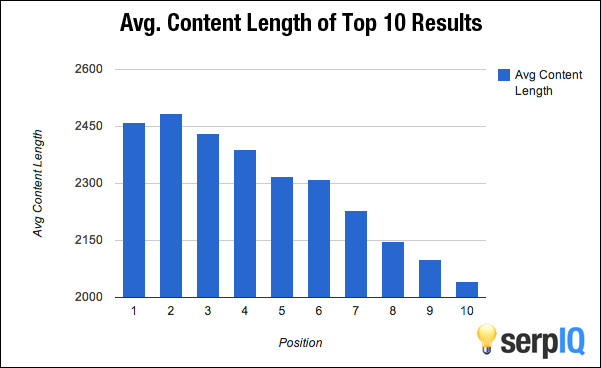 OkDork looked into how content length impacted the total number of social shares. 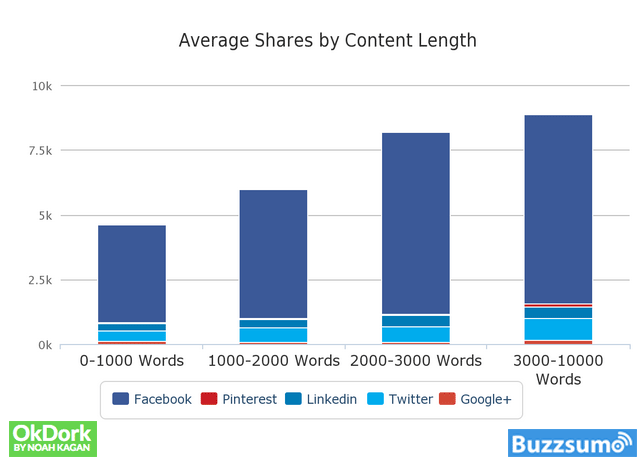 Posts with 3000 to 10000 words had the greatest amount of social shares. The biggest jump in social shares occurred with posts that had at least 2000 words. When you Venn Diagram all of these results together, the ideal word count for a blog post comes out to 2500+ words. Over the years, I have taken on new clients that have had an existing blog which is made entirely of posts that are less than 500 words. After I added a few long form posts, all of the Google rankings of their short form posts improved. The takeaway here is that Google likes domains that publish long form content. At the very least, try and write one post per month with a word count greater than 2500 words. Determine the average word count of the top 10 Google rankings for the keyword phrase that you are attempting to rank for. Multiply the average word count by 20% to identify the minimum word count of your blog post. If the average word count for the keyword phrase “Dentist Marketing Ideas” is 1000, then your post will need have at least 1200 words to compete. Some topics will be ultra competitive and require you to write 4000 words. Others will have little competition and may require you to write only 800 words. Most of us do not have time to write daily epic blog posts that have over 2500 words. Pro bloggers use a word count rotation. 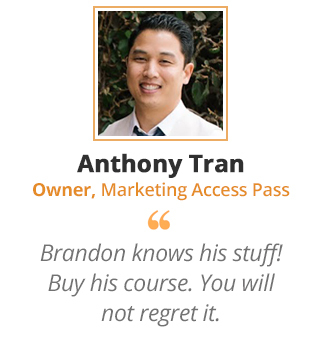 With this schedule, you would need to have three buckets of keyword phrases. 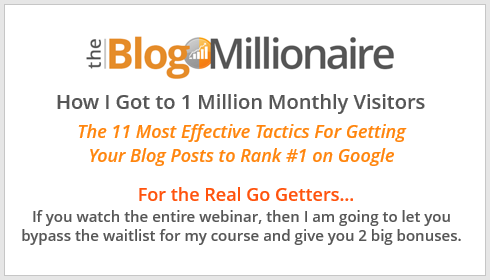 The keyword phrases in this bucket will have less than 100,000 Google results. The keyword phrases in this bucket will have between 100,000 and 200,000 Google results. The keyword phrases in this bucket will have more than 200,000 Google results. This strategy allows you to use keyword research metrics to determine how long each article needs to be. The greater the number of Google results for a specific keyword phrase, the more number of words you need to have to compete. You can run your entire blog posting calendar through a three tabbed Google spreadsheet. One tab for each bucket.